Sentai Filmworks LOVES Cosplayers and the cosplaying community. We love to #SentaiNoticedYou whenever we’re out at the cons, and we want to notice you guys with a very special contest. 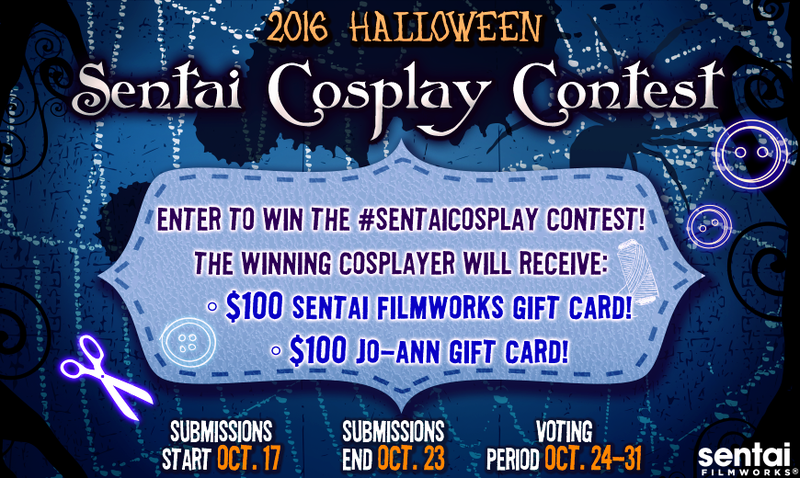 Step 1: Submit your favorite Sentai Cosplay photo via the form below between OCTOBER 17 through OCTOBER 23. Make sure you include the #SentaiCosplay hashtag in your description. Please note that you MUST be cosplaying as a character from a Sentai Filmworks show. For more information about which shows qualify, take a look at our catalog Sentai Filmworks Anime or Hulu page. Step 2: Get your friends, family, and fans to vote for you during the voting period between OCTOBER 24 through OCTOBER 31. It’s that simple. The cosplayer with the most votes takes home the prize, and everyone who participates will get a special Halloween discount in their email inboxes.